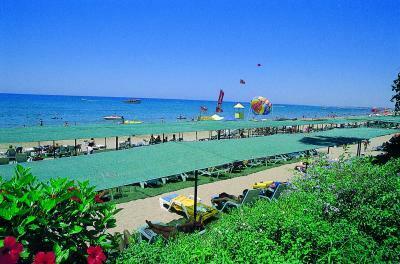 The Sirma Hotel & Apartments are situated right on the beach. Side is just 1.5 km away (easy reached by local dolmus). 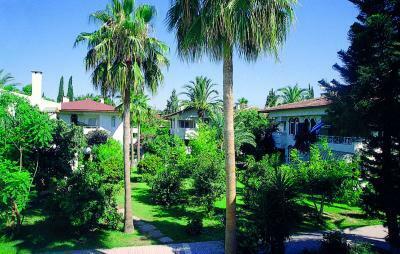 The well - kept garden of Sirma Apartments insure peacefull days relaxing. The Antalya airport is just 70 km away. Reception * restaurant with terrace * a la carte restaurant * 2 bars * outdoor swimming pool with children's section * indoor pool * irregular entertainment programmes * table tennis * minimarket * children playground * water sports (payable locally). Kids club * mini disco * playground. Water sports * massage * sauna * peeling * Turkish bath * beauty center with hairdresser * ce cream * quality wine * fresh fruit juices * Turkish coffee. Hotel rooms: bathroom (WC + shower + hairdryer) * central air-conditioning * satellite TV * safe box (payable locally) * telephone * minibar * carpet * private balcony (Max 2 Adults + 1 Infant(0-6). 2 bedrooms * 1 living room * kitchenette (fridge, 2 electrical rings, basic equipment) * bathroom (WC + shower + hairdryer) * private balcony * telephone * central air - conditioning. 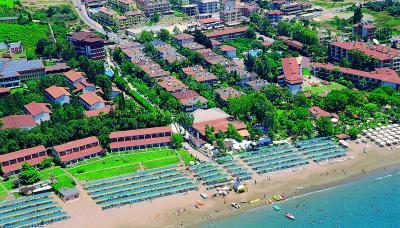 Hotel & Apartmens are situated right on the sandy beach. Sunbeds and umbrellas free of charge. Breakfast, lunch and dinner in buffet form. Snacks in the afternoon, coffee break.